ATV trails must be adequately marked so that people who aren't familiar with the area can easily follow them. Getting lost is no fun and could be quite hazardous even on a major trail if you should run out of fuel, have a breakdown, or needed medical help and not know where you are. View ATV trail signs. View this page, the ATV Trail Signing Guidelines as a PDF (323KB). Our challenge to all of you is to make sure that no one gets lost or injured on your trails. Specific land marks, highway crossings, town lines, mileage to certain points, location of support facilities, etc. should be identified. This will inform riders where they are and how to get to the services they need. Installing Kiosks or smaller information boards with maps at parking areas and intersections showing people where they are in relation to the trail system is a great way to help keep people oriented. Mapping and marking rescue locations is also a great idea that has been done in some areas. If people need help, they can easily give their location to rescue personnel making it quicker and easier to find them. If you decide to do this, you need to coordinate it with State and local Search and Rescue Agencies so the correct locations are chosen to ensure everyone has the same information and you have a workable plan. The Bureau has developed these guidelines for marking trails and we urge everyone involved in ATV trail maintenance to follow these guidelines so all trails are adequately and uniformly marked throughout the State. Generally, trails in Maine are two-way, which requires marking for travel in both directions. Generally signs should be installed on the right side of the trail. Signs need to be installed facing the direction people are coming from so they can be seen in a timely manner. When two or more signs are used in conjunction, the more important message to be conveyed should be in the higher position. We recommend signs be installed on sign posts instead of trees because usually sign posts can allow signs to be posted closer to the trail so they are more visible. If signs are installed on trees, they should be installed with staples or aluminum nails so they don't cause a sawing hazard. 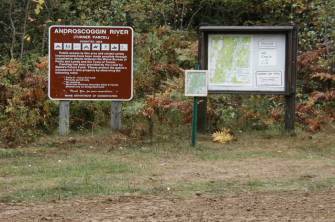 ATV signs should be placed only where the landowner or manager has authorized a trail. Remove all signs if the trail is discontinued, rerouted, or abandoned. The ATV Program provides plastic signs that will last for a long time if properly installed. Signs should be mounted on a stiff backing to make them more resistant to wind and adverse weather. Backings can be made from plywood, tempered hardboard, rough lumber, or similar materials. Many times those of us familiar with a trail know it so well that we fail to install enough signs or give enough information for people who may not be familiar with the trail system. We recommend you have people who aren't familiar with the trail ride it and tell you if there needs to be more signs. This is a great way to get new club members involved! Most of us at some time or another have gotten lost or at least temporarily turnd around on some trail system because it wasn't marked well enough, the message had faded, or tree limbs etc. blocking the signs hadn't been trimmed recently. Regular sign maintenance is important! You can't put signs up in the spring and then never check them again. Paint markers are ideal for written information since they resist fading. It's very important that signs be regularly checked and maintained. This shouldn't be just the job of the trail master. All of us need to play a part in helping keep the trails open and safe. Trail crews should carry extra signs with them to replace ones that have been destroyed or to install new ones in areas where a potential hazard has developed or signing is inadequate. So you ask, "Why do you have a street light in the sign guidelines?" Well I'm glad you asked. The good thing about streetlights is they have created an easily recognized and accepted color standard. Green is Go, Yellow is Caution, and Red is Stop. Because people generally understand this color standard, we have adopted this color scheme for ATV trail signing. The green signs are all positive affirmation that you are on the trail. The yellow signs contain some kind of cautionary or warning message. The red and white signs tell you to stop, don't go, or don't do something. Please keep this color scheme in mind when installing signs. This sign should be used at regular intervals along the trail to reassure the rider they are still on the trail. A blaze immediately beyond an intersection or road crossing informs a rider where the trail continues on the other side. This is especially important when the crossing is not direct. This sign should be used at the beginning of a trail, such as at a Clubhouse, parking lot, or place of business, etc. It should be used to show the trail name, number, destination, and/or direction of travel (NSEW), etc. as well as the name of the club maintaining the trail. In some instances this sign can be used instead of the Trail Blazer, as it may be easier to see at the entrance from a field or other large clearing. This sign should be used when the trail travels through croplands, tree plantations, or anywhere a landowner has given permission to cross their lands only at a specific location. This is also a good sign to use anywhere riders may be tempted to access an unauthorized side trail. It may also be appropriate to install these at picnic areas or at kiosks as a reminder to users. Remember that without the landowners' cooperation there would be no trails! This sign should be used together with other signs to provide additional information that is helpful to the user. It can be used to mark town lines and geographic names as well as distance and direction to businesses or destinations etc., to help orient the rider. If a club has the trail mapped, they may want to note reference pointssuch as trail name or number to match the map. We recommend you use a paint marker when writing on these signs. Regular markers tend to fade quickly in the sun and may soon be unreadable. This sign should be placed on the trail to notify the rider to proceed with caution due to a variation in the trail condition. The sign should be placed far enough in advance so that the rider has enough time to react accordingly. A blank space is provided on the sign for specific information to be written such as narrow bridge, steep grade, blind curve, intersection, ditch, and gate, etc. If more information is necessary, then a Trail Information sign should be used in conjunction with the Caution sign. This sign is used to show right-hand or left-hand turns. It is generally not used to mark the trail straight ahead; a trail blaze is used for that. 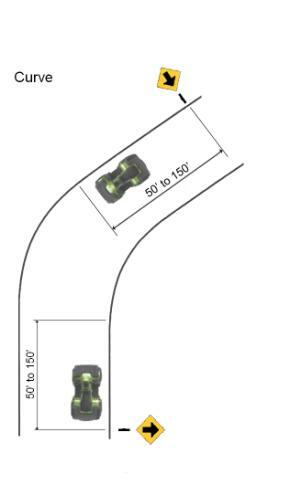 The arrow should be placed far enough in advance of the corner to allow the ATV rider ample time to slowdown. The actual distance necessary will vary depending on the normal travel speed of the trail it's located on and how sharp the corner is. This sign should only be used to mark bridge abutments, fence posts, gate openings, or other similar hazards that the operator has to drive between or avoid. The diagonal stripes should point down and toward the trail opening. The sign should not be used to replace arrow, caution, blaze, or any other sign. This sign is to supplement the Stop sign. It should be placed in advance of the Stop Sign to give riders ample opportunity to slow down in order to safely stop. Terrain, speed, and visibility will determine the location but the sign should be placed at least 100 feet in advance of the Stop Sign. See chart on the bottom of this page for ranges based on estimated speed of travel. This sign should be placed at each public and private road, or railroad crossing. The route number or name of the road that the trail is crossing should be written in the space provided. This will help people orient themselves, especially if they have a map. Don't write the trail name or direction on the Stop sign. This sign should be placed at the approach to steep hills, bridges, road crossings, or anywhere else where tire spin could break down the trail and lead to erosion causing sedimentation or a hazard. This sign should be used to post trails or roads where ATV use is prohibited. It might also be beneficial to use a blank information sign to clarify why ATVs are not allowed. Example: An apple orchard, a tree farm, drinking water source protection area, etc. 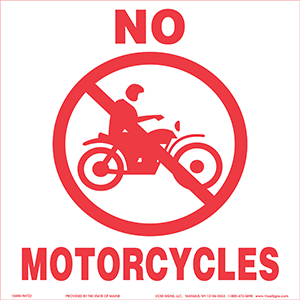 This sign should be placed in locations where landowner's policies prohibit the use of motorcycles. It should also be used in addition to NO ATV signs to post trails or roads where both ATV and Motorcycle use is prohibited. This sign should be used to temporarily close approved ATV trails when the ground is wet. It is especially important in the spring of the year when the frost is coming out of the ground. This sign is generally not available to clubs. It is used to designate shared use roads on the Bureau of Parks and Lands that are open to ATVs as well as bicycles, horses, cars, and trucks. This sign is generally used to mark trails that are wide enough to potentially be mistaken as roads for automobiles. This sign should be used to clearly mark trails where the use of trucks and jeeps are prohibited by landowner policy. It is also used on all State owned multiple use rail trails. This is a Department of Transportation (DOT) Sign that can be installed on state roads to warn motorists that there is a trail crossing ahead. It is generally not used everywhere, but should be considered in locations with high-speed travel. It is installed by DOT. and has to be paid for by the Club or Municipality who requested its installation. An alternative might be to try and locate the trail crossing in a better location if possible. This is a Department of Transportation style steel sign that is available through private sign companies. This is the sign that is to be used if a public road is officially designated for use by ATVs. This has to be purchased by the Club or Municipality and must be installed on authorized roads instead of the regular ATV trail signs. You may want to also post a speed limit sign under it to further regulate the use. 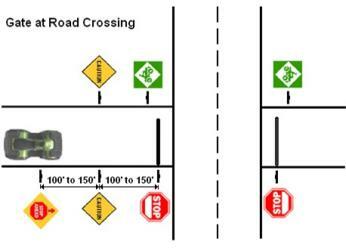 The following are examples recommended placement of signs in relation to the distance and direction from the hazard. Because of the unique hazard with gates at road crossings, it is very important that we have extra warning. For that reason we recommend a Caution sign in addition to the Stop Ahead sign. Generally, each of these signs should be located a minimum of 100 feet in advance of the previous one. In the case of gates or other similar man- made hazards we recommend caution signs be installed on both sides of the trail. 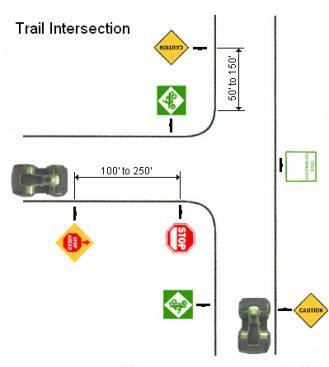 Trail intersections should be marked so that riders have ample time to slow down or stop before the intersection. It should also be well marked with directions so they know which way to go to their destination. The anticipated speed of travel will dictate how far in advance of the intersection the signs need to be installed. Generally the Stop Ahead sign will need to be further from the intersection than Caution sign because the riders have to stop instead of just slowing down. Bridges should be marked with Caution signs and Object Markers. Generally riders don't have to stop at bridges but they might have to if it's only one lane wide. Considerations like width, visibility, approach, height of railing, and anticipated speed are all factors to be considered when placing signs. 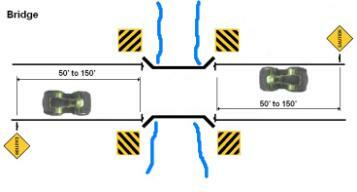 Object Markers should be mounted on both sides at each end of the bridge with the black lines pointing down and to the center. The normal travel speed and visibility will dictate how far in advance of the bridge the caution signs need to be installed. A blind approach or narrow bridge may require Caution signs be installed on both sides of the trail. 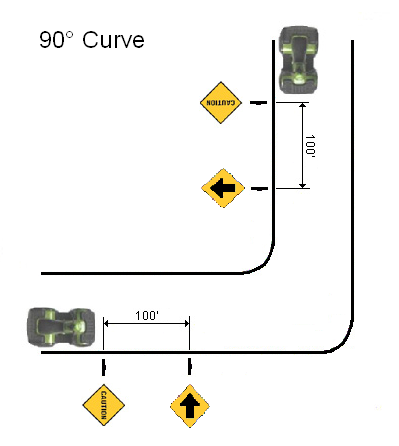 Curves and Corners need to be marked so riders have ample time to slow down enough to safely negotiate it. The anticipated speed on the section of trail and the sharpness of the corner will dictate exactly how far in advance the signs have to be installed. In any case the signs must be prior to the corner not at or after it. If it's a real sharp (90 degree or more) or blind corner, you may need a Caution sign placed in advance of the arrow to give extra warning to riders. In most cases this will be determined in large part by normal travel speed and width of that section of trail. The faster the ATVs can operate the more likely it is that you need to add a Caution sign. Ideally, signs should be installed on sign posts along the side of the trail. In most cases signs are actually installed on trees. When the opportunity presents itself we encourage you to install signs on posts. Generally, the signs should be on the operator’s right and should be a few feet off the side of the trail at approximately eye level. In some cases it may be necessary for signs to be real close to the trail and in other situations they may have to be as much as 10 feet off to the side. There are also situations such as when signs are being vandalized that you may have to install the signs quite high to keep them from being torn down. Generally, you should try to avoid installing signs higher than 10 feet or lower than 4 feet. We have included the information below to give you an idea of how different trail speeds impact the distance needed between signs and the hazard. Safety on the trails is very important; therefore we must always strive to keep the trails well maintained. Our goal is that people will be able to safely enjoy their sport while riding our trails. These guidelines are designed to help all of us work to that direction. ATV Program, Bureau of Parks and Lands, 22 State House Station, Augusta, Maine 04333-0022. ATV Coordinator by E-mail or call (207) 287-4958 out of state.